Know, my son, and make all others know, that it is a probable and proximate sign of eternal damnation to have an aversion, a lukewarmness, or a negligence in saying the Angelical Salutation, which has repaired the whole world." These words are at once terrible and consoling, and we should find it hard to believe them if we had not that holy man for a guarantee, and St. Dominic before him, and many great men since. But we have also the experience of several ages; for it has always been remarked that those who wear the outward sign of reprobation, like all impious heretics and proud worldlings, hate or despise the Hail Mary and the Rosary. Heretics still learn and say the Our Father, but not the Hail Mary nor the Rosary. They abhor it, they would rather wear a serpent than a Rosary. 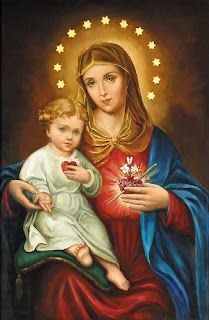 The proud also, although Catholics, have the same inclinations as their father Lucifer; and so have only contempt or indifference for the Hail Mary, and look at the Rosary as a devotion which is good only for the ignorant and for those who cannot read. Excerpt from True Devotion to Mary by st. Louis De Montfort. Hail, Heart of my Jesus, save me! Hail, Heart of my Savior, deliver me! Hail, Heart of my Judge, pardon me! Hail, Heart of my Spouse, love me! Hail, Heart of my Master, teach me! Hail, Heart of my King, crown me! Hail, Heart of my Benefactor, enrich me! Hail, Heart of my Pastor, keep me! Hail, Heart of my Friend, caress me! Hail, Heart of the Infant Jesus, attract me! Hail, Heart of Jesus dying on the Cross, atone for me! Hail, Heart of Jesus in all its Conditions, give Thyself to me! Hail, Heart of my Brother, remain with me! Hail, Heart of incomparable Goodness, forgive me! Hail, Heart most Glorious, shine forth in me! Hail, Heart most Amiable, inflame me! Hail, Heart most Charitable, work in me! Hail, Heart most Merciful, answer for me! Hail, Heart most Humble, repose in me! Hail, Heart most Patient, bear with me! Hail, Heart most Faithful, make satisfaction for me! Hail, Heart most Adorable and most Worthy, bless me! Hail, Heart most Peaceful, calm me! Hail, Heart most Desirable and most Beautiful, delight me! Hail, Heart most Illustrious and most Perfect, ennoble me! Hail, Heart most Holy, Balm most Precious, preserve and sanctify me! Hail, Heart most Holy and most Salutary, reform me! Hail, Heart most Blessed, true Physician and Remedy for all our ills, heal me! 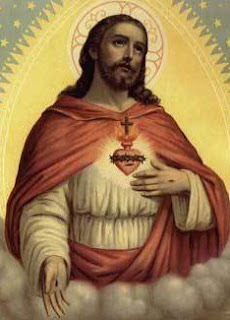 Hail, Heart of Jesus, Consolation of the afflicted, comfort me! Hail, Heart most loving, ardent Furnace burning with Love, consume me! Hail, Heart of Jesus, Model of Perfection, enlighten me! Hail, Divine Heart, Source of all Happiness, strengthen me! Hail, Heart of eternal Benediction, call me to Thee! Thanks to Madalena for sharing. ...Spiritual mothers of priests have additional concerns, although not in ways all that different from those of biological mothers. She prays that priests will be holy, that they will be conformed to Christ, have the humility to allow Christ to work through them in every moment, and will be good Fathers. She takes them as her sons by adoption, yet loving them as her own, just as Joseph loved Jesus as his own child. She carries them with her in hear heart, pondering the Paschal Mystery, the Misterium Fidei, and the Priestood, knowing they are one and the same. She ponders deeply the needs of her Sons, understanding human nature, never in denial of that reality, even as she recognizes how we strive for holiness, and the importance for all that their spiritual Fathers, Priests, remain in a state of sanctity. Holy Priests create Holy People. It's a fact that cannot be denied. And if one of those Priests should fall, she does not abandon him, but prays and sacrifices all the more so that he, like the Prodigal Son, might return home and be welcomed and celebrated by the Father. 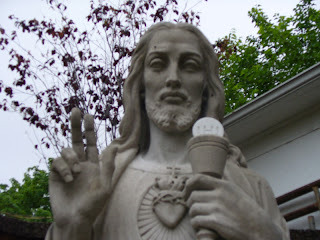 Pope Benedict XVI announced that the universal Church will celebrate a Jubilee Year of the Priest, beginning June 19th, 2009, the Solemnity of the Sacred Heart of Jesus, and celebrating the 150th anniversary of the death of the saintly Cure D’Ars. It is my personal experience of 25 years this month living inside of the Church in novitiates, seminaries, pontifical universities, parishes, and chancery offices that we are always in need of renewal and energizing in every vocation, more so than ever in the priesthood. The Holy Father knows this, as do a great many of us priests. So, beginning June 19, 2009 we’ll try to move toward this goal of strengthening and energizing the priesthood. This happens one priest at a time. Holiness is an individual work in process for all of us, the priest included. 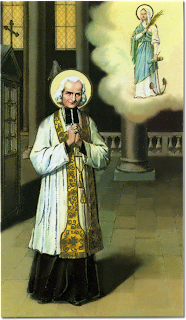 The patron saint of parish priests, St. John Mary Vianney, should be used as a model in principle, remembering that every man or woman must be a person of their time. Nonetheless, there are principles and practices that transcend time and space. These we should know and exercise. The preeminence of prayer and the spiritual life must come first for the priest—or any practicing Catholic for that matter. St. John Vianney prayed long hours before the Blessed Sacrament. That was the “secret” of his “success.” Jesus in the Eucharist must be the heart of the priest’s life, the Holy Spirit is the breath that breathes life into his ministry. A simple life, not unfamiliar with penance and sacrifice is also fundamental for apostolic fruitfulness. Jesus, the High Priest, gave us all his own Mother to be our spiritual mother. Every priest that would bear fruit that endures must accept the gift of Mary the Mother of Priests as his own spiritual mother. This cannot be over emphasized. A failure to do it in these times results in almost certain failure for the Catholic priest. Pray for your priests more than ever this Year of the Priest. In many cases there is poor morale, little camaraderie, isolation, and loneliness in the life of the priest. Encourage your priests and remember a little kindness and understanding goes a long way. Priests are human beings, like other human beings, with the same weaknesses and strengths. This year think about the life of priests and how you can contribute to their perseverance and holiness in a most noble vocation. Help your priest get to Heaven by your kindness and your prayers. You will never be sorry that you did. St. Philomena, patroness of the Universal Rosary appearing to St. John Marie Vianney in a vision. Beginning at a young age and throughout his life as a priest, St. John Vianney demonstrated great sacrifices through fasting, prayer and sleep depravation in order to meet the needs and demands of thousands of parishioners who sought confession and his counsel on a daily basis. Following in his example and in honor of him, we are asking all of our members to join us in 40 days of prayer and fasting for all priests beginning today, June 19, 2009. Through our combined prayers and fasting, we can help all priests live out their vocation and mission in this difficult culture to bring Jesus Christ, our first and most holy priest and "the one mediator between God and men" (Catechism of the Catholic Church: 1544) to all people in our society. Without our beloved priests, we cannot have Christ in the Eucharist, for it is the priest, who through the grace of God, is a minister of this most Holy Sacrament – most important and at the center of our Catholic faith. The priest acts as another Christ and is deeply needed by all humanity. He is there for us from birth to our death and in all key moments of our lives of joy or suffering. He, like Christ, sacrifices himself for the salvation of souls. We also invite you to print the following prayer and pray it often. Shelter them in Thy heart. Mary, Queen of the Clergy, help all priests. The Catholic Church must acknowledge that some priests have done great harm to others, but it also must thank God for the gifts the majority of priests have given to the church and the world, Pope Benedict XVI said. The following maxims are from the January collection of maxims and sayings written by St. Philip Neri as a yearly spiritual guide. I am sharing the ones that I feel will benefit us the most. 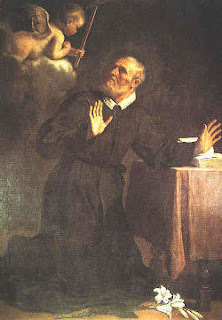 As you can see, St. Philip Neri stresses the virtue of obedience. - It is well to choose some one good devotion, and to stick to it, and never to abandon it. - Spiritual persons ought to be equally ready to experience sweetness and consolation in the things of God, or to suffer and keep their ground in drynesses of spirit and devotion, and for as long as God pleases, without their making any complaint about it. - He who wishes to be perfectly obeyed, should give but few orders. - Men should often renew their good resolutions, and not lose heart because they are tempted against them. - Obedience is a short cut to perfection. - There is nothing which gives greater security to our actions, or more effectually cuts the snares the devil lays for us, than to follow another person’s will, rather than our own, in doing good. - Before a man chooses his confessor, he ought to think well about it, and pray about it also; but when he has once chosen, he ought not to change, except for most urgent reasons, but put the utmost confidence in his director. - Obedience is the true holocaust which we sacrifice to God on the altar of our hearts. - In order to be really obedient, it is not enough to do what obedience commands, we must do it without reasoning upon it. 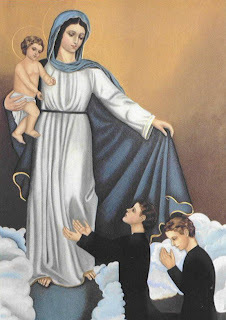 - Our Blessed Lady ought to be our love and our consolation. - The good works which we do of our own will, are not so meritorious as those that are done under obedience. - In order to be perfect, we must not only obey and honour our superiors; we must honour our equals and inferiors also. - A man who leads a common life under obedience, is more to be esteemed than one who does great penance after his own will. - To mortify one passion, no matter how small, is a greater help in the spiritual life than many abstinences, fasts, and disciplines. In commemoration of the upcoming Year of the Priesthood, The Word Among Us Press is planning to publish a book of stories written by priests active in all types of ministries in the church. We want stories and testimonies that speak in a personal way of a priest’s call to his ministry and how his relationship with God sustains him and his work. We also want stories that describe the joys and challenges of everyday life as a priest. Fr. Daren has details on how a priest can submit his story to the Word Among Us. While you are over at Fr. Daren's blog, be sure to read the story of his call to the priesthood. And, for those of you not familiar with the Word Among Us, check out their website. Sts. Peter and Paul, Honolulu, generously make their monthly magazine available to all parishioners. What a wonderful source of inspirational stories, Gospel reflections, etc. Please take a moment to read Bishop Serratelli's Pastoral Letter on the Holy Eucharist. Bishop Serratelli's new Pastoral Letter. "On the Solemnity of the Most Holy Body and Blood of Christ, I wish to offer you some theological, historical and practical reflections on the Eucharist. 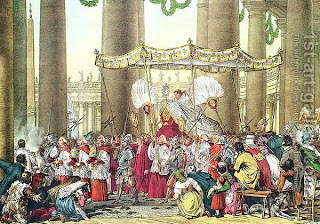 The Eucharist is “the culmination of the spiritual life and the goal of all the sacraments” (Summa Theol., III, q. 66, a. 6). Our rediscovery of this mystery opens us to the rich and inexhaustible gift of divine life. When we come to the Eucharist reverently and worthily, “we draw water joyfully from the springs of salvation (Is 12:3). In this mystery of the Eucharist, we are renewed and the Church herself grows. For this purpose, I offer the following pastoral instruction." And forever, in peace, may you wave. A real live nephew of my Uncle Sam. 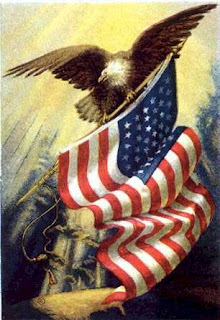 I am a Yankee Doodle Boy! He is a Yankee Doodle Boy! O my beloved Jesus, O God, who hast loved men with so exceeding love! what more canst Thou do to make Thyself loved by these ungrateful men? Oh, if men loved Thee, all the churches would be continually filled with people prostrate on the ground adoring and thanking Thee, and burning with love for Thee at seeing Thee with the eyes of faith hidden in a tabernacle. But no; men, forgetful of Thee and of Thy love, are ready enough to court a man from whom they hope for some miserable advantage, while they leave Thee, O my Lord, abandoned and alone. Oh that I could by my devotion make reparation for such ingratitude! I am sorry that I also have hitherto been, like them, careless and ungrateful. But for the future I will not be so any longer, and I will devote myself to Thy service as much as I possibly can. Do Thou inflame me with Thy holy love, so that from this day forth I may live only to love and to please Thee. Thou deservest the love of all hearts. If at one time I have despised Thee, I now desire nothing bu to love Thee. O my Jesus, Thou art my love and my only good, "my God and my all." Most holy Virgin Mary, obtain for me I pray thee, a great love for the Most Holy Sacrament.